Fatmah Bamashmous, a student from Saudi Arabia pursuing her MFA in furniture design, wants to create modern furniture with distinct Arabic influences, drawing inspiration from calligraphy and the Arabic alphabet. 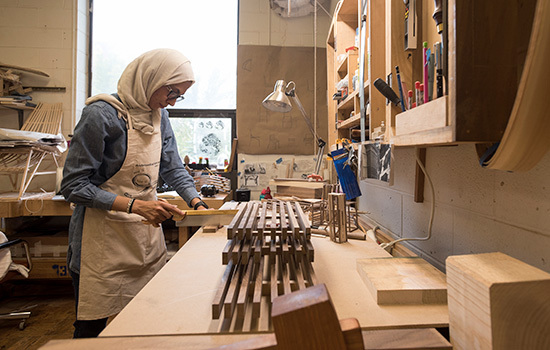 As Fatmah Bamashmous painstakingly crafts furniture for her thesis in RIT’s woodworking studio, she uses a mixture of traditional hand tools and state-of-the-art power tools. She has a distinct vision for what she is trying to accomplish, and her designs draw inspiration from calligraphy and the Arabic alphabet. “I want to create modern furniture with distinct Arabic influences, which you don’t see hardly anywhere,” she said. After studying interior design in Saudi Arabia, she wanted to better understand how to make furniture she was incorporating into her designs. 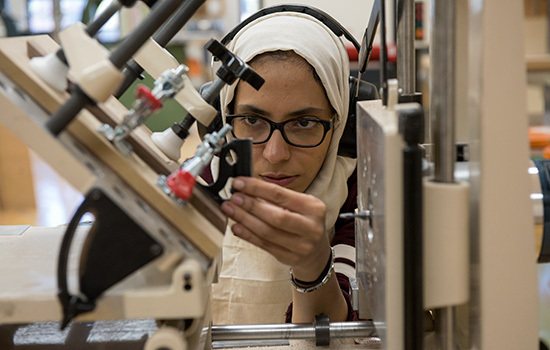 Wanting to study at a top school with the best equipment possible, she learned about RIT’s internationally recognized program through its prominent place on lists ranking the top furniture design programs in the world. The furniture design program Bamashmous is enrolled in is RIT’s oldest master’s program. RIT awarded its first master’s degrees to three students in the woodworking and furniture design MFA program in 1960. Today, RIT offers 73 master’s programs, with 14 new programs added in just the past 10 years. The newest program is a Master of Science in media arts and technology that was introduced this year, and next year students will begin studying for their master’s in data science. The number of master’s programs is likely to grow even more in the near future—during RIT President David Munson’s address to the community in August, he announced an ambitious long-term goal of rebalancing the RIT student body to one-third graduate students and two-thirds undergraduate students. Currently, RIT has 3,222 graduate students out of a total 18,963. RIT’s master’s programs vary from research-based curricula that can serve as launching pads to prestigious Ph.D. programs to career-focused programs that prepare students for coveted positions in industry. Mariel Abreu ’07 (MBA) analyzes fixed income securities of some of the largest financial institutions in Latin America for Baltimore-based asset manager T. Rowe Price Associates. Working in the Emerging Markets group, she evaluates the financial health and repayment capacity of corporate debt issuers primarily in the banking sector. Part of her responsibilities includes traveling to Latin America to meet company representatives and regulators. Abreu, originally from the Dominican Republic, got her start in the financial industry at one of the big four accounting firms in the Dominican Republic before moving to Rochester in 2005 to pursue her MBA. Her first job in the U.S. came in the summer of 2006 after she applied for an unpaid summer internship at a boutique accounting firm in New York City through the RIT Job Zone portal. This year, more than 56 percent of RIT’s graduate students were from outside the United States, with 60 graduate students from the Dominican Republic alone, fourth-most among all nations. “This is a testament to our internationally recognized programs and enriches the diversity of our campus,” Cummings said. Abreu’s summer internship in New York paid off. She spent her spare time learning about the different careers in the finance industry and getting guidance from established professionals. 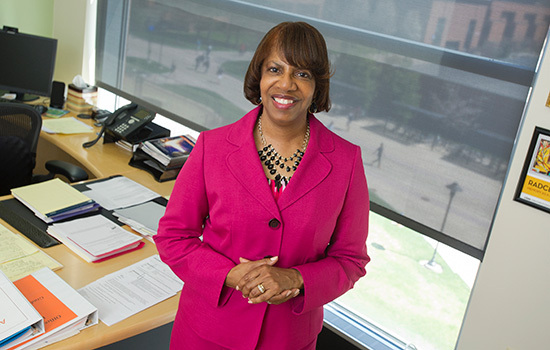 She returned to RIT in the fall with important connections, a clear understanding of the career paths in finance and determined to get into Wall Street after completing her MBA. Upon graduating in 2007, she went back to New York and got a job as Junior Equity Research Analyst with HSBC Securities to cover Latin American banks. After weathering the financial crisis of 2008 and several management changes at her firm, Abreu managed to move her way up to vice president with coverage responsibilities of the mid-cap banking sector in 2011. After more than seven years in the “sell side” of the industry and becoming a mother, Abreu thought it was time for a change. For her, moving to asset management, or the “buy side,” was the ideal transition. The change came in 2014 when she joined T. Rowe Price’s Emerging Market team. Her Latin American region banking experience, finance industry background, language skills and the lessons she took away from her time at RIT had her prepared for the next challenge. “The MBA program at RIT provided me with the necessary business foundation that employees in finance demand,” she said. 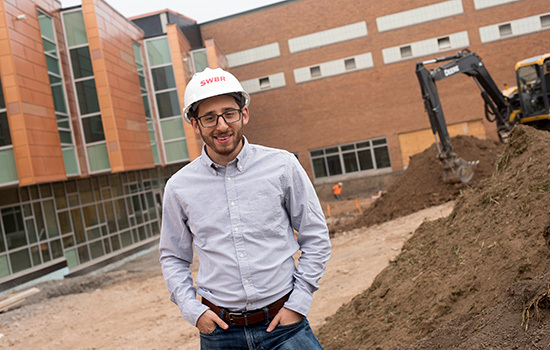 Closer to home, Sam Elliot ’16 (architecture) works on design projects for elementary, middle and high schools in his native city of Rochester for the architectural firm SWBR. But he took a circuitous path to get back home. After earning a BA in environmental studies in 2011 from Allegheny College, Elliot headed to the West Coast for an internship in San Francisco, but the move didn’t click for him. When he returned to the area he worked on the Greentopia Festival with Friends of the GardenAerial, an organization working to establish an EcoDistrict and elevated park around the rim of the High Falls Gorge in downtown Rochester. While volunteering with the organization he decided he wanted to pursue a graduate degree, but not in environmental policy, the focus of his undergraduate degree. The program, approved in 2011, is unique in its focus on sustainable design, urban development and use of the latest technologies. The change in direction was revitalizing for Elliot. Cummings said while there are many well-respected Master of Architecture programs across the world, RIT’s stands out because of its unique focus on sustainability. “Many of our programs stand out in distinctive ways because of a specialized focus or because they lie at the intersection of technology, the arts and design,” she said. As Elliot studied at RIT, he landed an internship with SWBR. The firm hired him as an architectural designer before he graduated, and he finished his thesis on nights and weekends as he worked full time. Now he works in SWBR’s education studio, contributing throughout the design process on many of the firm’s K-12 projects. He maps existing conditions for renovation projects, puts together drawing sets for construction purposes and helps to supervise during the construction process itself. Thriving in a vibrant, personally fulfilling profession, he credits much of his success to the lessons he learned at RIT. Some of RIT’s most recent graduates from master’s programs are already obtaining coveted positions in top companies across the country. Hongbo Miao ’17 (human-computer interaction) now works in Seattle for Microsoft as a program manager focused on the user and developer experience. Before coming to RIT, over the span of four years Miao earned bachelor’s degrees in information security and business administration from Harbin Institute of Technology in China and computer systems engineering from the University of Birmingham. So when he set out to pursue his master’s degree, he was looking for a unique program with an interdisciplinary spirit. With focus on creating user-friendly computing technologies, HCI is a dynamic field that melds theories from psychology, science, engineering and design. Cummings said the HCI master’s program is an example of how RIT’s graduate programs are often ahead of the curve. The program in this relatively young field has been around for 10 years. The HCI program’s emphasis on the user experience, coupled with its interdisciplinary nature, was what attracted Miao. He gravitated toward the concept of improving software to make people’s lives easier and found that the hours he spent testing his projects on everyday users led to the best results. Before graduating from the HCI program in the spring, he secured an interview with Microsoft at the RIT Career Fair and was eventually hired. Following commencement, he moved to Redmond, Wash., to join the company, and he is now working on software programs including Microsoft Graph, Microsoft Office Extensibility and Microsoft Excel. As RIT looks to expand its master’s programs offerings, it will take intense effort from many people behind the scenes. Christine Licata, senior associate provost, explained that each new academic program goes through a rigorous academic program planning, review and approval process. The process ensures each program is sustainable, fills an important niche in the changing academic and workforce landscape and meets the standards set by RIT, Middle States accreditors and the New York State Education Department. Some programs, such as the upcoming MS in data science, grow out of recommendations made by deans’ industry advisory committees. And as some at RIT work to usher in new programs, others are working just as diligently at making sure all current graduate students at RIT have an environment to thrive in. Bamashmous has noticed the effort in creating a welcoming ambiance. She has formed a tight bond with her fellow classmates and the professors who have mentored her, calling out Andy Buck, Rich Tannen and Adam Rogers as important figures in her development. Upon graduation, she will return to her home country, Saudi Arabia, which sponsored her studies here through a scholarship, with a completely new skillset and a unique style incubated at RIT. More than 270 people have earned doctoral degrees from RIT in six programs since the first degree was awarded in 1993. The programs are imaging science, microsystems engineering, computing and information sciences, color science, astrophysical sciences and technology and sustainability. A seventh program, a Ph.D. in engineering, is expected to have its first graduates this May. And an eighth Ph.D. in mathematical modeling began last fall. Ph.D. programs have grown so much that in January 2016 the Carnegie Classification of Institutions of Higher Education changed RIT from Masters-Comprehensive to Doctoral University. This change occurs when a university graduates more than 20 Ph.D. degrees per year. The doctoral programs are unique. RIT has the only Ph.D. program in color science in the United States. The doctorate program in sustainability is the only program in the world to focus on sustainable production systems. The Ph.D. in computing and information sciences was designed to focus on real problems in both computing itself and business, engineering, medicine, science and social science from a fundamental research perspective. Read more from an earlier issue of RIT: The University Magazine at http://bit.ly/RITphd. 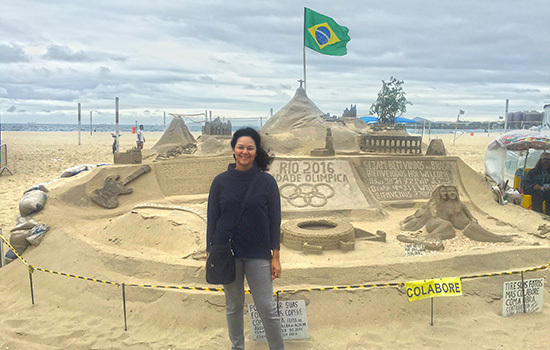 Mariel Abreu travels throughout Latin America to locations like Rio de Janeiro for her job as a fixed income analyst at T. Rowe Price Associates.